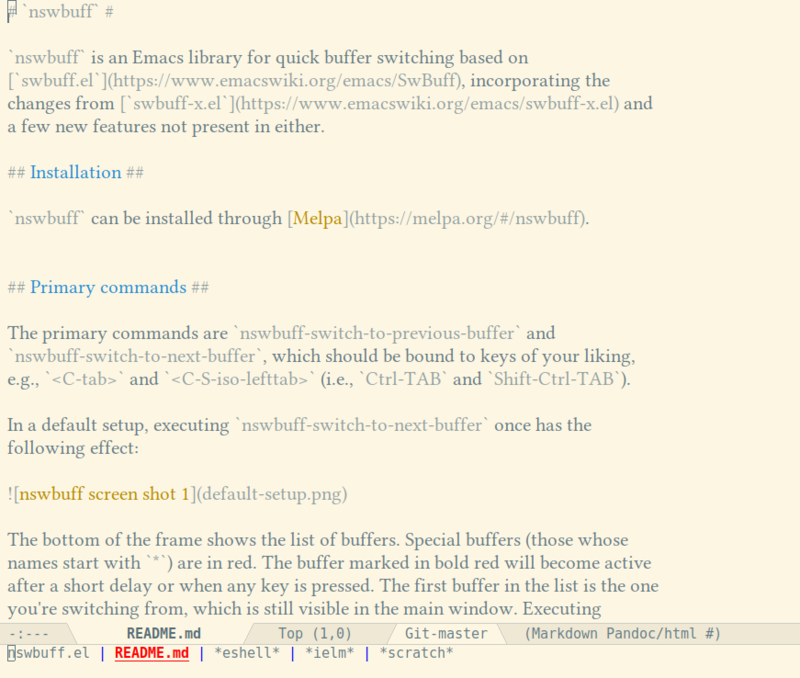 nswbuff is an Emacs library for quick buffer switching based on swbuff.el, incorporating the changes from swbuff-x.el and a few new features not present in either. nswbuff can be installed through Melpa. The primary commands are nswbuff-switch-to-previous-buffer and nswbuff-switch-to-next-buffer, which should be bound to keys of your liking, e.g., <C-tab> and <C-S-iso-lefttab> (i.e., Ctrl-TAB and Shift-Ctrl-TAB). The bottom of the frame shows the list of buffers. Special buffers (those whose names start with *) are in red. The buffer marked in bold red will become active after a short delay or when any key is pressed. The first buffer in the list is the one you're switching from, which is still visible in the main window. Executing nswbuff-switch-to-next-buffer again will highlight the next buffer in the list (*scratch* in the screen shot). This screen shot also shows that the face and colors used for displaying the buffer names are fully customizable. The buffers that nswbuff offers for cycling are essentially the buffers returned by the function buffer-list. There are a few options to customize this list, however. First, you can exclude buffers with nswbuff-exclude-buffer-regexps. Any buffer whose name matches one of the regexps in this list is not switchable. The default setting excludes buffers whose name begin with a blank character. 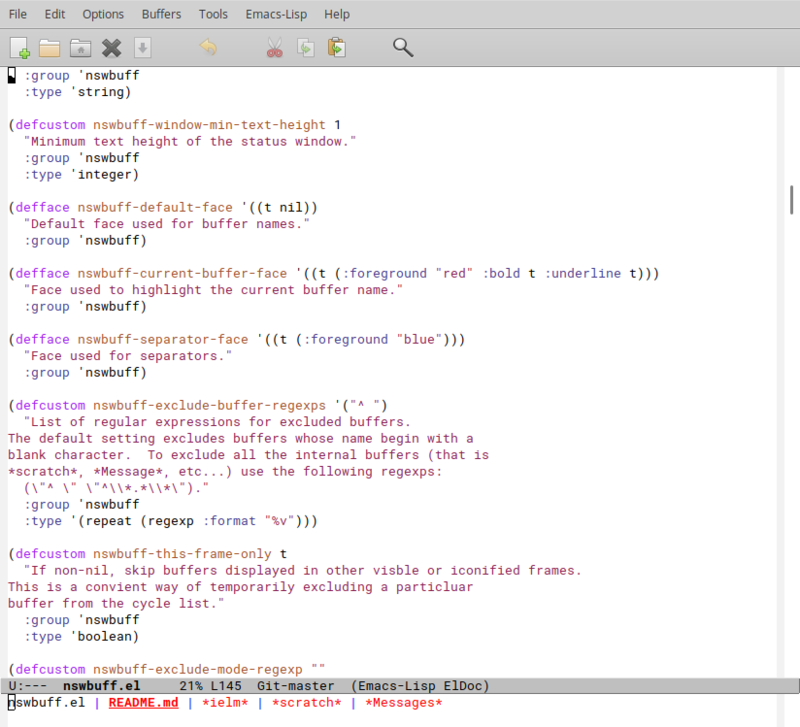 To exclude all the internal buffers (that is *scratch*, *Message*, etc...) you could use the following regexps '("^ . *" "^\\*.*\\*"). Buffers can also be excluded based on their major mode through the option nswbuff-exclude-mode-regexps. These regexps are matched against the symbol-name of the buffer's major mode. Buffers that match one of these options but should be included anyway can be matched using the option nswbuff-include-buffer-regexps. Any buffer matching one of the regexps in this list is included, regardless of whether they also match an exclude regexp. Obviously, the same effect can also be obtained by using more specialized exclude regexps, but using an include regexp is usually easier to understand and less error-prone. Another option for customizing the list of switchable buffers is nswbuff-buffer-list-function. This can be set to a function that returns a list of buffers, making only those buffers switchable instead of all buffers returned by buffer-list. If the function in nswbuff-buffer-list-function returns nil, nswbuff falls back to the buffers returned by buffer-list. Note that the list of buffers returned by the function in nswbuff-buffer-list-function is still matched against nswbuff-exclude-buffer-regexps, nswbuff-exclude-mode-regexps and nswbuff-include-buffer-regexps, so set (or keep) these to nil if you don't want this. Lastly, buffers can be excluded through a buffer-local variable nswbuff-exclude. This variable can be set to t in a file-local variable block or in a .dir-locals.el file to exclude specific files from switching that cannot be easily captured in another way. For example, if you want to exclude certain Org files (e.g., the agenda files) from the buffer list without excluding all Org files, you could use this method. Quite a few aspects of nswbuff can be customized in addition to the ones already mentioned. See the customization group nswbuff for details. nswbuff provides some very simple but nifty integration with Projectile. If you set nswbuff-buffer-list-function to nswbuff-projectile-buffer-list, only the buffers belonging to the current Projectile project are offered for switching. This makes for a very light-weight (but in my opinion effective) alternative to such modes as perspective.el or persp-mode. Switching buffers with nswbuff keeps you in the project, any other buffer-switching method (C-x b, ivy, helm, or what have you) is not affected and can thus be used to move out of the project. Note that nswbuff-projectile-buffer-list has another property: if you're in a project, it adds any buffers in buffer-list whose name matches nswbuff-include-buffer-regexps to the list of buffers it returns. Since this option is normally nil, it has no effect, but if you set it to, e.g., '("\\*scratch\\*"), the *scratch* buffer is offered for switching even when you're in a project. This, too, moves you out of the project, of course.